American culture looks back on the 1950s as the period when rock and roll was born. Sometimes, the influence of the jazz, or rhythm and blues, of the African-American south are recognized in its development. Still, little press is given outside of those intimately involved with the music world, to the specific tensions of that breakthrough time, when the south was defined by its color divide, and even the crossing over of musical forms was potentially dangerous. And that is where the Tony-winning musical “Memphis” takes over. 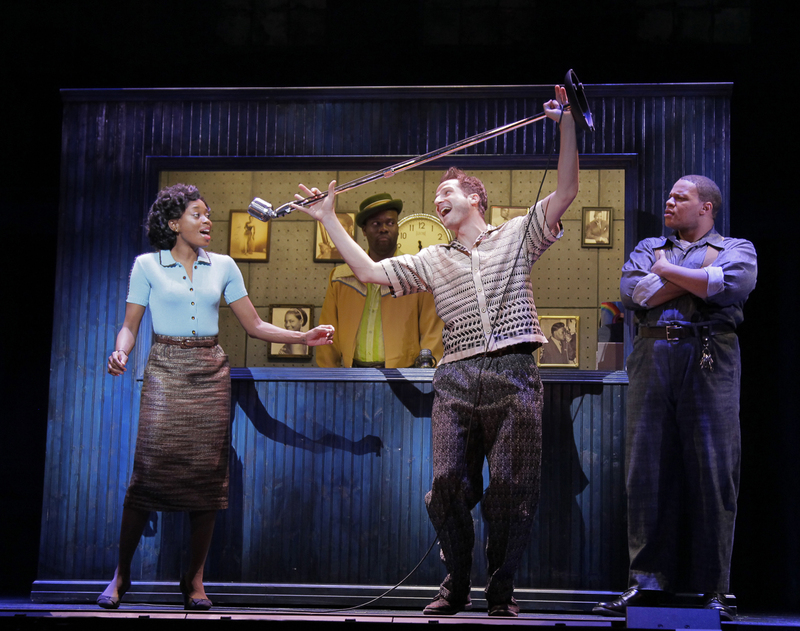 Now making its west coast debut at the Pantages Theatre, “Memphis” supplies the completely apocryphal but nonetheless representational story of how white America discovered the music which would define the era. Illiterate dreamer Huey Calhoun talks his way into the juke joints of the African-American part of Memphis in the early 1950s, and his obvious passion for the music being sung there gains him gradual if grudging acceptance. Spurred to spread the word about a genre he feels deserves a larger audience, he muscles his way onto a major local radio station, and from there to a tenuous but spectacular American dream. Yet, it is a dream he wants to control, even as he would control the future of the young woman he falls for and promotes. Is she willing to remain in a town where this very romance is both dangerous and illegal? Is he willing to detach himself from the city he consistently claims defines him? “Memphis” uses as the essential conflict this division between the growing acceptance of “Black” music by white southern teens and the fearsome segregation which defined all of Tennessee society at that same time. And it rocks with lots of emotional and tuneful music, wildly energetic dance numbers and a kind of folksy passion. If only they hadn’t decided they needed a big production number for what should have been a gentle, even wistful ending. Bryan Fenkart embodies the unsubtle, folksy Huey – a man so sure of his own rightness he cannot, or will not, see the realities of the world around him, a trait which has both positive and negative consequences. Singing kind of out of the side of his mouth, with a twang a mile wide, he vibrates with an earnest energy which powers much of the show. As Felicia, his beloved and the singer destined for stardom, Felicia Boswell embodies both the fear and the joy of someone swept up in Huey’s dreams while facing the darkest realities of segregation. Her voice varies from the controlled R&B of the era, to elaborated gospel, to showstopper belting with significant success. Others worthy of special mention within this large ensemble company include Julie Johnson as Huey’s dubious but loving mother, Quentin Earl Darrington as Felicia’s equally dubious and protective brother, and William Parry as the radio and television station owner – a tricky part as he must be reasonably sympathetic and elementally racist at the same time. Rhett George and Will Mann, as friends of Felicia’s who find their worlds enhanced by Huey’s dreams, add depth to the piece. Yet, though this show has some overtones of depth, what people come to the show for is the music. David Bryan’s passionate old school rock and R&B songs, from silly, reminiscent pieces like “Scratch My Itch” to the passionate song of place “Memphis Lives in Me,” provide show stopper after show stopper. You cannot help but boogie along. Still, what happened to those early record companies and those who tried to fight the co-opting of this inherently African-American music by more marketable white performers, hangs over the story line, as it should. Leaving it in that space would have been a truer tale than the sudden and intrusive huge “let’s get everyone on stage and rock the house again” final scene. Except for that choice, Christopher Ashley’s fast-paced and innovative direction keeps the episodic tale from losing momentum, yet stays appropriate to the varying moods expressed. The use of television cameras to add layers to the scenes at appropriate moments is particularly brilliant. Sergio Trujillo’s choreography radiates adrenaline, thanks to a talented ensemble of dancers. Paul Tazewell’s costumes plant it thoroughly in the period. In the end, “Memphis” is a not-quite-history lesson, at least of the attitudes and balances which marked the beginning of what we think of as rock and roll. If you are interested, move fast. The show is only in Los Angeles for two weeks, an awfully short visit for something given such high honors on another coast.